﻿ Too many orchids? Loss of orchid nurseries. Change in the orchid business. Most of the topics covered in this column originate from questions posed by hobbyists or from problems and experiments in my own greenhouse. The one serious problem in my growing area this past month is one I warn hobbyists about on a regular basis. In my own defense, however, it has come about because of events beyond my control. The problem is overcrowding, i.e. too many orchids. As most orchid hobbyists knows, it is impossible to have one of every kind of orchid and each new hobbyists needs to decide early in the infection period what they want from their orchid addiction. Is it a nicely flowered orchid on the table 365 days of the year or to grow unusual orchids, etc? It is OK to change these goals as the addiction grows or your knowledge of orchids expands and interests change. But space is always an issue. My space problem began as the direct result of “International Trade” and “Speculation by Oil Traders”, at least that is the story I tell my wife. The influx of large numbers of inexpensive phalaenopsis and members of the Oncidium-Alliance from Asia has cut the profit margins of once-profitable American orchid nurseries at the same time heating prices soared. This has forced many once-prominent orchid nurseries out of the orchid hybridizing business. My problem began when they began to sell their “once outrageously priced” breeding stock. Orchids that were never offered for sale or at prices that only wealthy Arab sheiks or Japanese business moguls could afford were now within my grasp. Orchid nurseries have closed at such a pace that some of these plants were selling for the price of an average meristem and risked being lost to future generations of orchid hybridizers. What else could I do but add these prizes to my collection? The only thing a self-respecting orchid grower could do was to rescue these poor orchids. Along with the joy of having such special plants comes the sadness of realizing that many great hybridizers that once used them to make novel hybrids have moved on. Very soon, American orchid hobbyists will to limited to orchid hybrids that originated outside the U.S. and mass produced for the wholesale pot plant market. 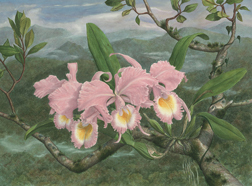 It was the domestic sale of extra plants for this market that allowed most American orchid nurseries to experiment and in the process create new hybrids and color forms. Hopefully, a many of these once-prized orchids are finding their way into private collections where they will be maintained. The Internet is one way to make contacts and exchange plants, seeds and pollen, but orchid hobbyists seeking the unusual are going to have a more difficult time finding them once the glut of stud plants has left the sales tables.